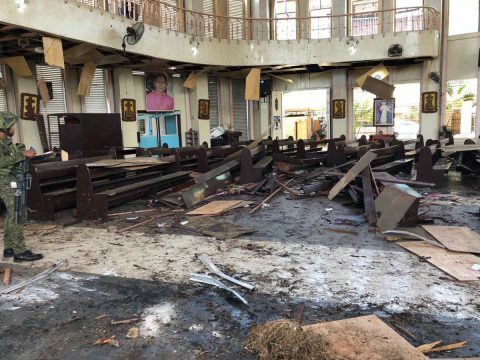 The interior of Jolo Cathedral following today’s twin blasts. Picture courtesy of Westmincom. A twin bomb attack on a Sunday Mass at Jolo Cathedral on Sulu Island has killed at least 20 people and injured dozens more. The Philippine government says it will “pursue to the ends of the earth the ruthless perpetrators” behind the terror attack today (Sunday, January 27). Security officials say the first bomb went off in or near the Cathedral of Our Lady of Mount Carmel during Mass, followed by a second blast outside the compound as government forces were rushing to the scene. Philippine National Police chief Oscar Albayalde said the casualties included both worshippers and troops responding to the first bomb. He added that an earlier casualty count of 27 had been downgraded due to “double counting”. Troops sealed off the road leading to the church while vehicles were transporting the dead and wounded to hospital. Some casualties were taken by helicopter for emergency treatment in Zamboanga City. “I have directed our troops to heighten their alert level, secure all places of worships and public places at once, and initiate pro-active security measures to thwart hostile plans,” said Defense Secretary Delfin Lorenzana. The government has vowed to pursue the attackers “until every killer is brought to justice and put behind bars. The law will give them no mercy”. Sulu Island has long been a stronghold of the Islamic State affiliated Abu Sayyaf terror group. The militants are holding at least five hostages — a Dutch national, two Malaysians, an Indonesian and a Filipino — in their jungle bases near Patikul town, not far from Jolo. Despite this threat, a few thousand Catholics live on the island, mainly in the capital of Jolo. The blasts came nearly a week after a referendum to create a self-administered area for the Muslim-majority regions of Mindanao was backed by 85 per cent of voters. Although most of the Muslim areas approved the Bangsamoro autonomy deal, voters on Sulu island rejected it in Monday’s vote.